Aqua-Tech AGRI presents a new approach to clearing out algae and dirty water from dams, ponds and water troughs. Thanks to strong inflows and rainfall, many dams and ponds are overflowing with water, creating a new challenge to keep these water sources clean and fresh for irrigation and stock. Triox Pty Ltd recently launched the Aqua-Tech Waterbac, an eco-friendly solution to keeping these water sources clear of unwanted contaminants and pathogens. The presence of excess nutrients and organic matter in the water combined with warm weather may provide the perfect conditions for algae to grow and also for the creation of smelly odours in the water source. 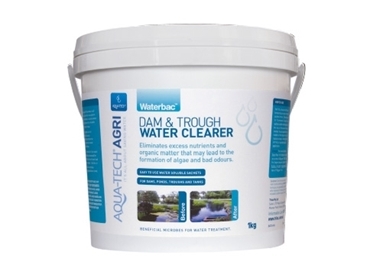 Developed in Australia 10 years ago, Aqua-Tech Waterbac dam and trough water clearer is based on an old natural treatment where farmers would toss an old hay bale or cut grass swath into their water holes and dams to clean them up. When the hay or cut grass is put in the dam the microbes would start feeding on the excess nutrients and organic matter in the water source. The Aqua-Tech Waterbac dam and trough water clearer employs a unique blend of Bacillus subtilus microbes that digests excess nutrients, organic matter and noxious microbes in the water. The algae and dirty water treatment process provides the same benefits as the traditional method with a super dose of B.subtilus without the mess to clean up. Aqua-Tech Waterbac algae treatment is available through Landmark stores in 250g, 1kg, 6kg and 10kg pails.